The major challenge for athletes and physical fitness buffs is to keep the muscles and brain energized. This is especially the case for endurance athletes who also need to recover their muscle power quickly after an intense workout and exercise. Muscle contraction and relaxation are driven by energy in the cells provided by the compound adenosine triphosphate (ATP). Muscles have only a limited supply of ATP, however. The ATP levels are rapidly used up during exercise, particularly in short, intense bursts of anaerobic activity. Many an athletes needs immediate replenishment of energy in the muscle during demanding regimens, such as sprinting and weightlifting. In these situations, the body produces ATP: The energy currency in the cells, which powers muscle movement and control. How much and how efficiently is ATP produced depends upon the amounts of creatine phosphate stored in the cell. Creatine is the biomolecule, which produces ATP.Creatine is indigenous to the human body, and is produced by the liver and stored in the brain, skeletal and heart muscles where it serves as a ready pool to produce ATP. 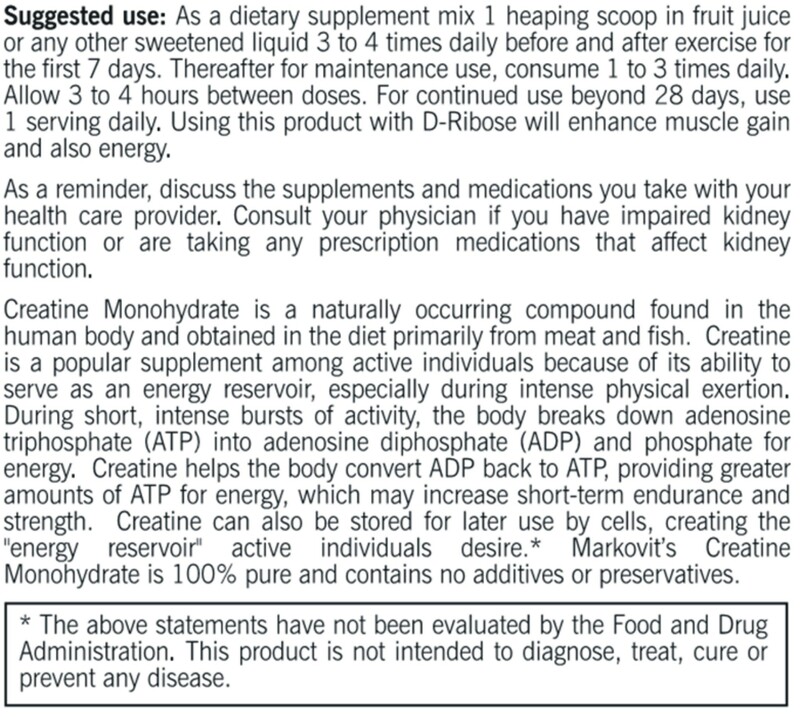 Creatine is the key substance that helps speed up the ATP refueling of the muscle. 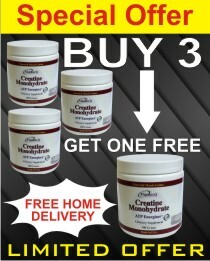 More creatine in the muscle means greater energy production that allows muscle to work longer and at higher intensity. 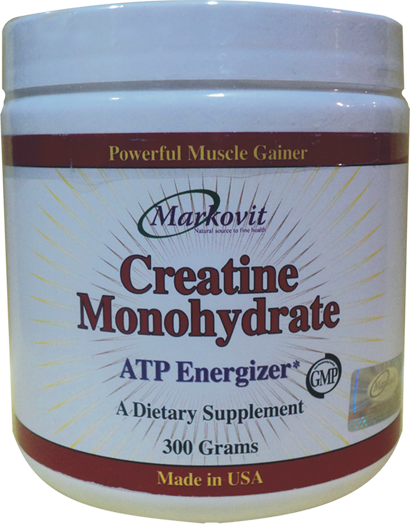 How does Markovit creatine help the muscle perform at higher efficiency and recover faster? 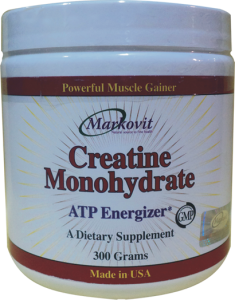 Creatine saturates the muscle to convert it into ATP. This conversion takes place in the absence of oxygen and is, therefore, used as an anaerobic pathway for energy. Creatine is, however, more than just an ergogenic nutrient: It has a voluminizing effect on the muscle. 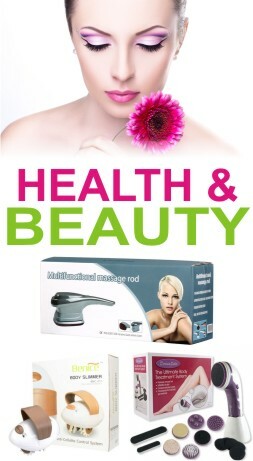 Cell voluminizing, or cellular hydration, involves binding of water to the muscle fiber. In turn, this binding gives rise to the “pumped” look. Since water is bound inside the muscle, the athletes using creatine do not have the “puffy” appearance. In other words, the muscle looks larger but, more importantly, has improved strength and has high energy and intensity. That allows the athlete to recover faster and have more energy for each training session. 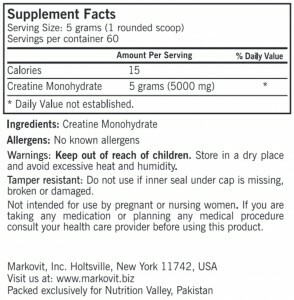 Markovit Creatine not only improves physical performance but also reduces mental fatigue and improves mental performance. 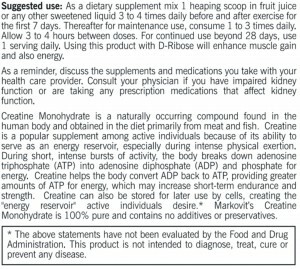 Creatine helps make more “fuel” available to the muscle in the form of ATP. This extra fuel ensures that the muscle works faster and longer and recovers faster after intense exercise or sustained physical activity. This also means that there is less muscle soreness and enhanced endurance. Numerous studies support the use of creatine for increasing endurance, building muscle mass and improving athletic performance. Creatine is, however, more than just an ergogenic nutrient: It has a voluminizing effect on the muscle. Cell voluminizing, or cellular hydration, involves binding of water to the muscle fiber. In turn, this binding gives rise to the “pumped” look. Since water is bound inside the muscle, the athletes using creatine do not have the “puffy” appearance. 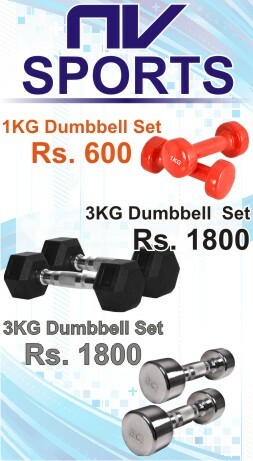 In other words, the muscle looks larger but more importantly, has improved strength and has high energy and intensity. 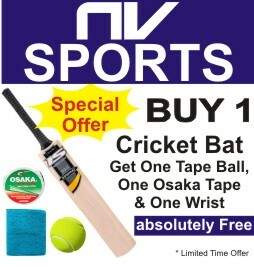 That allows the athlete to recover faster and have more energy for each training session.